The “Lietuvos Rytas” team celebrating victory in Turin. for 2008 – 2009. It is the second time for “Lietuvos Rytas” to win the Eurocup since the start of the Eurocup competition in 2002, the only team to have been able to do so. The Eurocup win ensures the invitation to “Lietuvos Rytas” to play in the Euroleague for 2009-2010. Euroleague, with 24 teams competing, stands as the highest tier of European basketball. There will now be two Lithuanian teams in Euroleague – “Žalgiris” from Kaunas and “Lietuvos Rytas” from Vilnius. There is also talk that the “Šiauliai” team from Šiauliai could now possibly join Euroleague, making it three Lithuanian teams in Euroleague! 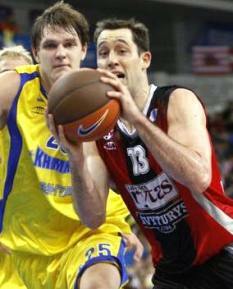 Chuck Eidison, an American playing for “Lietuvos Rytas”, was named as the most valued player in Eurocup 2008 – 2009.